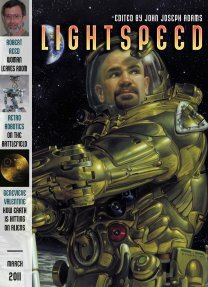 Two new pieces of fiction come to us in March from Lightspeed Magazine. Starting us off is “Saying the Names” by Maggie Clark. In this story, we meet Nia, who is traveling to an alien world to help defend her father who has been accused of murder. We learn about the race of creatures called the Bo, who don't believe in brevity and think that if something is worth talking about, its worth talking about at excruciating length. Nia has to examine the situation her father is in, and provide character defense at his trial. Along the way, she has to use caution not to offend the Bo while making her case. A well told tale that felt as alien as the Bo, and left me satisfied at the end. Next is “Woman Leaves Room” by Robert Reed. Following what seems like an artificial intelligence, we are there to witness its creator talking to it, and then follow it through time as it is restarted and people emerge years, decades, or even centuries later to interact with it and discuss its next step. The narrative is a bit disjointed at first, making it difficult to read, but after several minutes I found myself in tune with it. However, what I found most disconcerting was the similarities in this story and one by Rachel Swirsky called “The Lady Who Plucked Red Flowers beneath the Queen’s Window,” which was featured in Subterranean Magazine's Summer 2010 issue. While Swirsky's story is fantasy in origin and “Woman Leaves Room” is a science fiction story, the similarities are too obvious for me and therefore I couldn't get full enjoyment from the tale. I'm sure many will find the story to be wonderful and different, but I warn anyone who has read the aforementioned Swirsky piece that it will ruin the story for you.